Lest you think fall is upon us with a vengeance, it is not. It's just getting started, and a bit timidly at that. We're expecting some rain today, and the high temperatures will be lower than they have been this past week. The lows are starting to get lower, too, but not abruptly so. 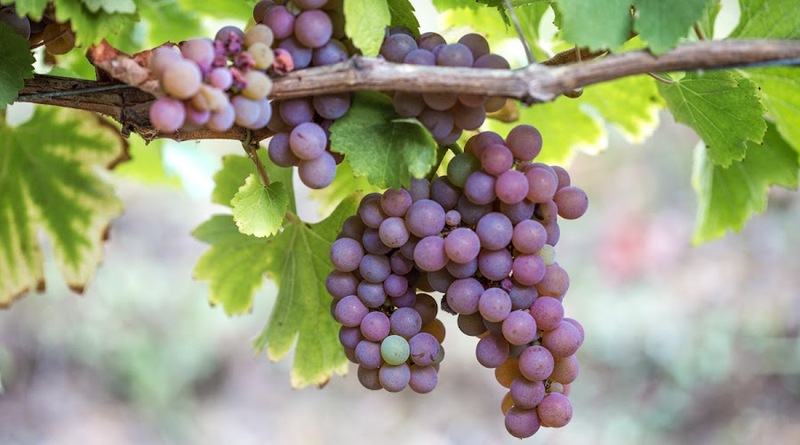 The grape harvest is under way, but there seems to be no hurry as there has been in past years when rain and cool temperatures threatened to rot a good part of the crop. This year summer is going out gently. So far. The vast majority of the vines in the vineyard still look like this. On the home improvement front, we have two major projects getting under way. That doesn't count the annual hedge trimming, which just got done. The first is the assembly of the new greenhouse. It will be built against the back of the house. We ordered the "kit" which was delivered during the summer. The guy who will assemble it will start in three weeks. If all goes well, the greenhouse will be ready for plants before the real cold kicks in. It will be great for over-wintering and for starting seedlings in the spring. The second project is a new shower in the bathroom. Our current modular shower stall (which we had installed in 2005) is showing signs of wear. It has developed cracks here and there and we worry about leaks. So we asked a contractor for an estimate to build a new shower and tile it in rather than replace the modular unit with another. He's also going to install a towel warmer in place of the old bathroom radiator and do a few other small plumbing jobs around the house. We accepted his estimate and he's ordered the materials. Soon he'll get the work started. There will probably be photos. 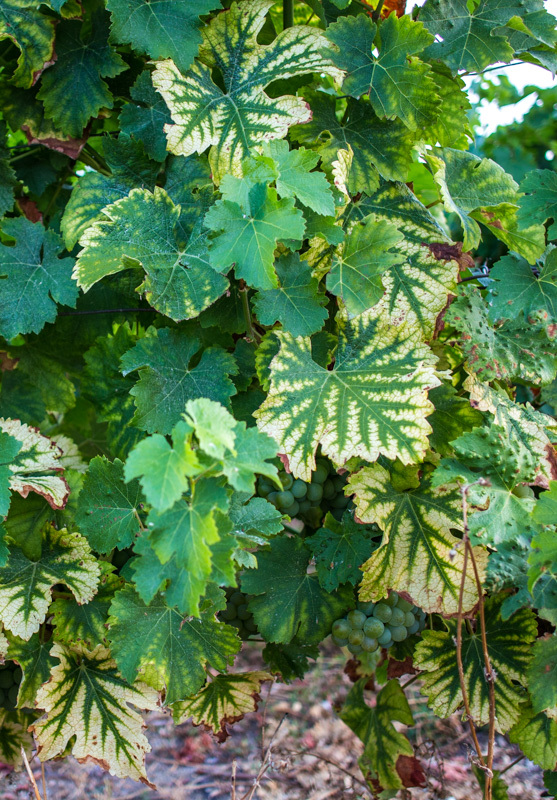 The grape harvest is under way and, as the nights get cooler and cooler, the grape leaves are starting to change color. It's subtle right now. When I look out over the vineyards from a distance I still see a sea of solid green. But here and there, when I walk among the vines, I find individual leaves getting a jump on their neighbors, the first to adopt the fall fashion. The chlorophyll is beginning to diminish, revealing spots of crimson on these leaves. Most of the leaves will go yellow and orange before becoming brown and falling to the ground. But some of the parcels will turn a brilliant red. I'll keep my eyes on them and try to get a good photo or two when that happens; it all depends on the light and the weather. The stems on this grape vine looked very intensely red. I don't know why, if it's the time of year or the variety of grapes. But I thought it looked cool, so I snapped a picture. Then I decided to remove all of the other colors to accentuate the red. I like the result. 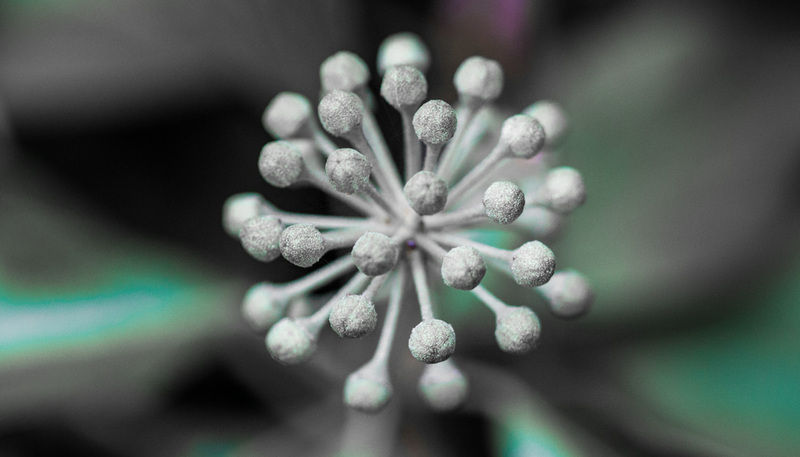 In this version, I removed all the colors except for the reds and oranges. So, you wonder, what does the original image look like? Well, one of the neat things about Lightroom is that it's non-destructive, Adobe's way of saying that all the changes you make to an image are just a set of instructions and that the original image is not altered. This version has all of its yellows, greens, and blues. 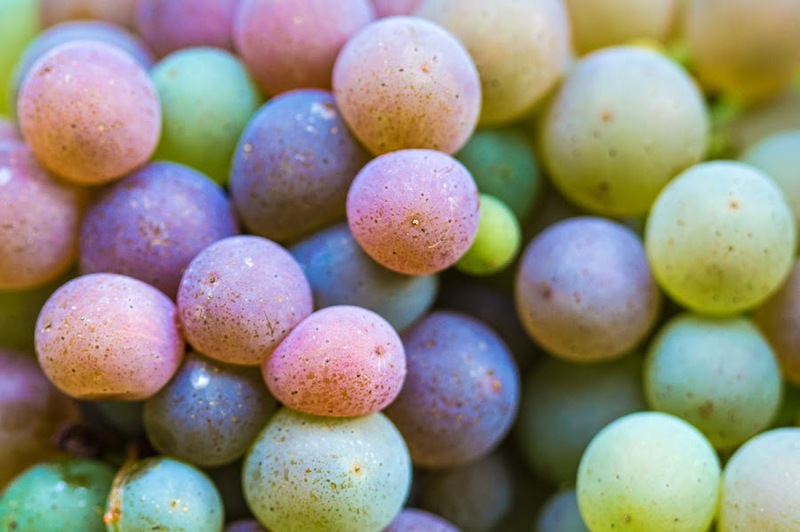 I can't stop posting pictures of grapes. This year's crop is the most abundant and beautiful in recent memory. 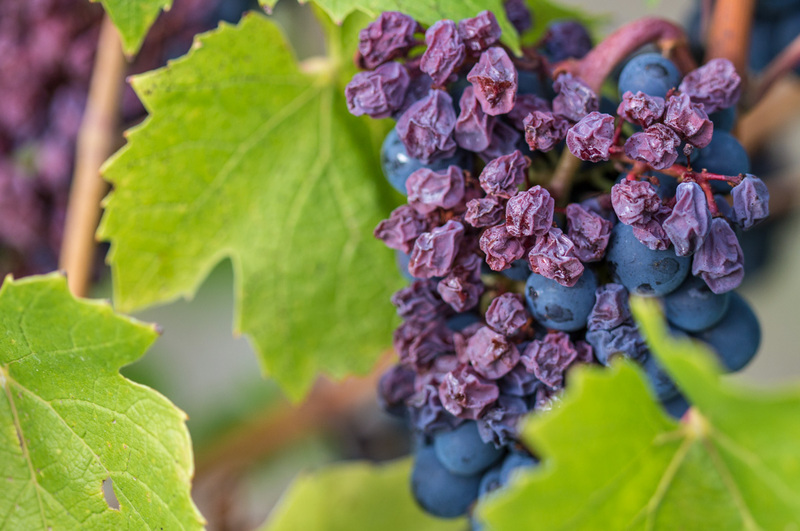 A very wet spring followed by a hot and dry summer seems to be just the right kind of weather for the grapes in our region. 'Tis the season. I think these are sauvignon rose (pink sauvignon) grapes. They're used as a blending grape, from what I've read. And while the very wet spring was a little too wet for my taste, the hot and dry summer more than made up for it. Now that fall is here, shorts and bare feet are no longer comfortable. It's back to long pants and socks. It won't be long until the heating season kicks in. These are some variety of Jerusalem artichoke, I believe. They're related to sunflowers, but with a much smaller flower head. They do grow tall, however. 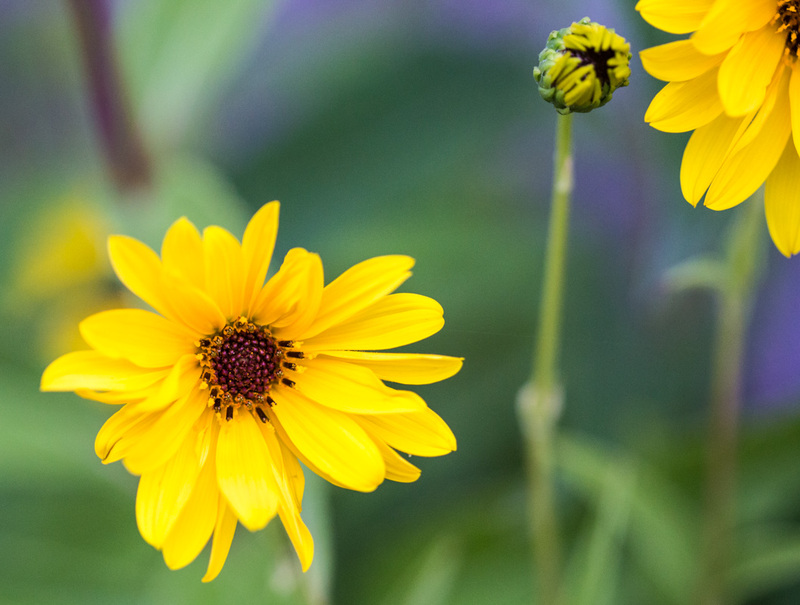 They bloom in late summer and early fall, so now is the time! These bright yellow blooms are very autumnal. A number of years ago, one of our neighbors was having these pulled out of her flower garden, so I asked her if I could have some. The tubers transplant very easily and these things will take over (which is why she was ripping them out). I now have them in four places around the property. They're pretty low maintenance and don't require watering beyond what rain they get (unless it doesn't rain at all, then some watering helps). 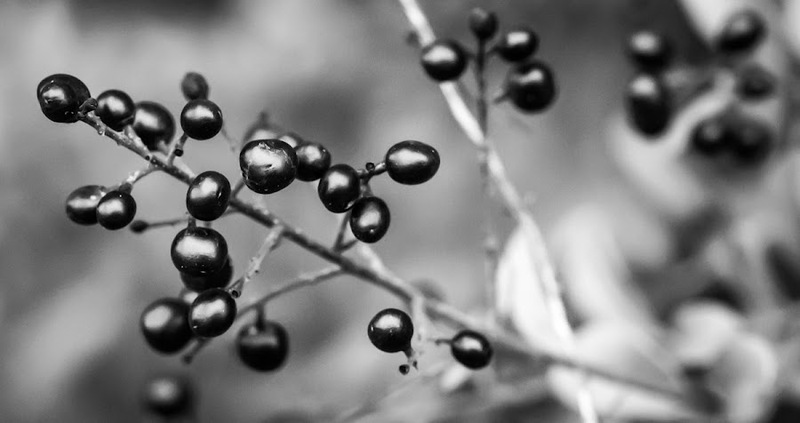 These aren't grapes, but some wild berries out on the edge of the woods next to the vineyards. They're black, or at least very deep and dark purple. I thought they'd look interesting without the distraction of the green and yellow of the leaves behind. So there you go. I'll bet these will be a fall meal for some form of wildlife. With two exceptions, I'm using the lenses I got for the old camera on the new one. The first exception is that the short 18mm-70mm zoom is not compatible with the new camera, so I'm not using that one. The second exception is that I got a new 24mm fixed lens for the new camera, so I've never used that on the old camera. I'm finding that the "old" lenses behave a little differently on the new, full-frame camera from how they behaved on the old cropped sensor model. The differences are subtle, but I notice them. I was right about the vineyard parcel that was hand-harvested on Thursday. The team of pickers spent a good part of the day out there. As of Friday morning, I still have not heard the hum of the mechanical harvesters. They're still waiting, I gather. They look like a collection of little blue moons. I'm not close enough to the process to know how the growers are timing their harvests, so we wait and see. Once they get started, it will take a few days, and then the vines will be stripped of fruit. Then crushing and fermenting will happen at the wineries. 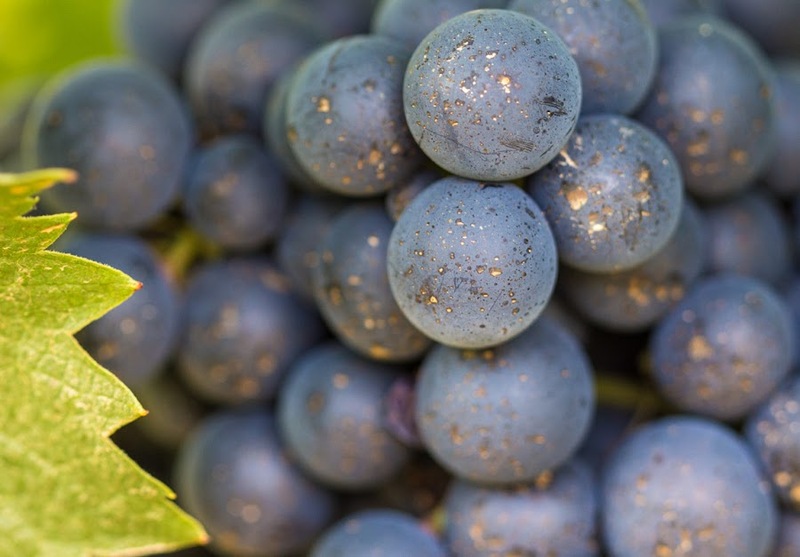 Bernache (partially fermented grape juice) will come out some time in October, then the primeur, or nouveau, wines will appear toward the end of November. The 2016 full vintage should be available sometime during the spring of next year. I think the grape harvest is getting started. I noticed a group of people out back doing what looked to me like harvesting a parcel by hand on Thursday morning. I'm guessing it won't be long until we see (and hear) the mechanical harvesters out there. I think this varietal is sauvignon rose, also called sauvignon gris. The mature grapes are pink in color. The weather remains dry. I think that's a good thing for the growers, allowing them to time the harvest for when the grapes are at their peak rather than having to hurry to get them in before they rot. The season started off very wet, but the summer was dry and hot. It will be interesting to taste the 2016 vintage next year. For Tuesday's lunch, Ken used the last of our eggplant harvest to make a favorite Greek dish of ours: moussaka. It's made with layers of potato, eggplant, and spiced ground lamb, all of which is covered with a béchamel sauce before being baked in the oven. So we built a whole Greek-themed meal around that, starting with champignons à la grecque (Greek-style mushrooms) and flavored Greek olives as an appetizer. 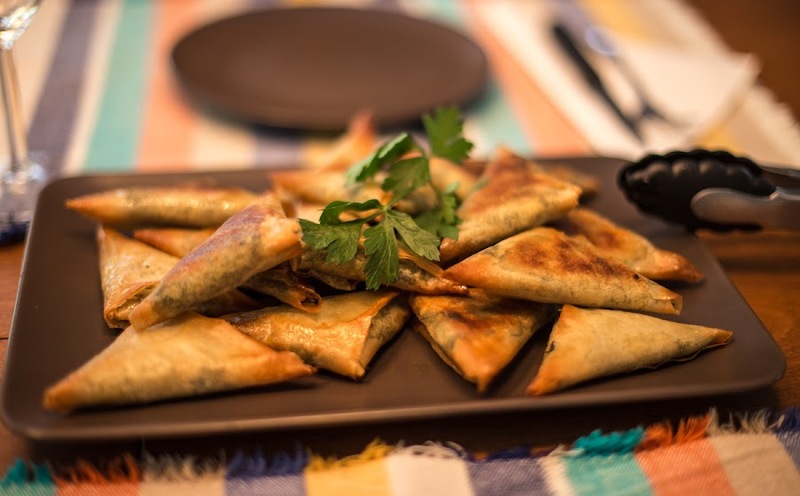 Our first course were these little spanakopita triangles served with a tzatziki sauce. Once the triangles are made, they get brushed with olive oil and baked in the oven. They're not true spanakopita in that I used Swiss chard from our garden in place of spinach, and substituted readily available feuilles de brick for phyllo dough, which is not easily found out here in the French countryside. I cooked the chard and chopped it up with spices and lemon juice, egg, and feta cheese. Then I folded the dough around the stuffing to form the triangles. It was much easier to do than I expected. The sauce was tzatziki, made with grated cucumber, yogurt, lemon juice, and olive oil. After the moussaka I served a Greek salad of tomatoes, peppers, cucumbers, Greek olives, and chunks of feta cheese on a bed of lettuce, dressed with a lemony vinaigrette. Finally, our dessert was a Greek lemon cake (from a recipe by Ina Garten). Yum! After the rain we had last week, some mushrooms have shown up. Nothing big, yet. 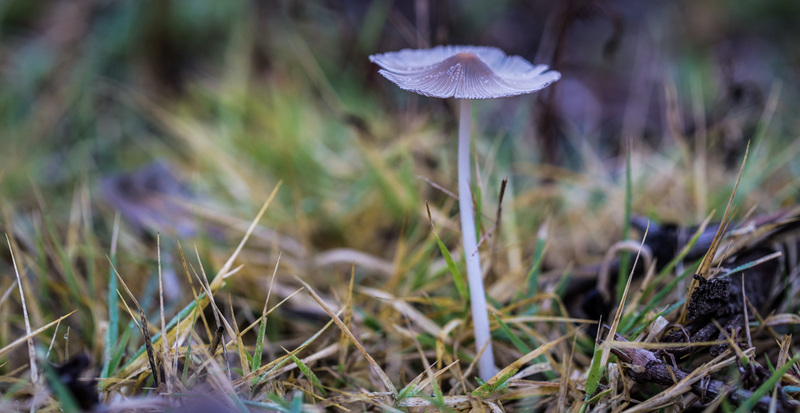 I saw these fragile little fungi on the side of the dirt road through the vineyard. As fall progresses, there will be more and more mushrooms, including the edible kind, to be found. There were four or five of these in the vicinity. I've never had the nerve to collect my own mushrooms, even though some edible ones actually grow in our yard. I'm not taking any chances. We buy our mushrooms from people that, we hope, know what they're doing. I don't know what kind of plant this is, but its flowers seem to be just budding now. I saw it on the edge of the woods next to a vineyard parcel. The flower heads are stretching out toward the light, away from the shadows of the woods. I'll have to check back in a few days to see what they look like once they've opened. Maybe then I'll be able to identify them. Of course, I'll need to find them again. Uh-oh. This is not the way commercial raisins are made. But they're (sort of) nature's version. The grapes on these vines found themselves exposed to the very hot sun we had for a while and they just shriveled up. I see a lot of these out in the vineyards right now, a testament to this year's hot and dry summer. I haven't tasted any of the "raisins." They're full of seeds. I've tasted the grapes here and there (don't tell anyone). They're very sweet, another consequence of the hot and dry summer. I wonder if the rain we had over the last few days will plump up the grapes any, toning down the sweetness with extra moisture? The rain didn't seem to scare the growers, otherwise we would have seen some harvesting activity. But they're not at it, yet. ...autumn. Just beginning, mind you. But the air is cooling and leaves are starting to gather on the ground. The grapes are heavy on the vine; I will be surprised if harvesting doesn't start this week. In the next few days the equinox will usher in nights that are longer than the days. This is a place that Callie likes to walk. 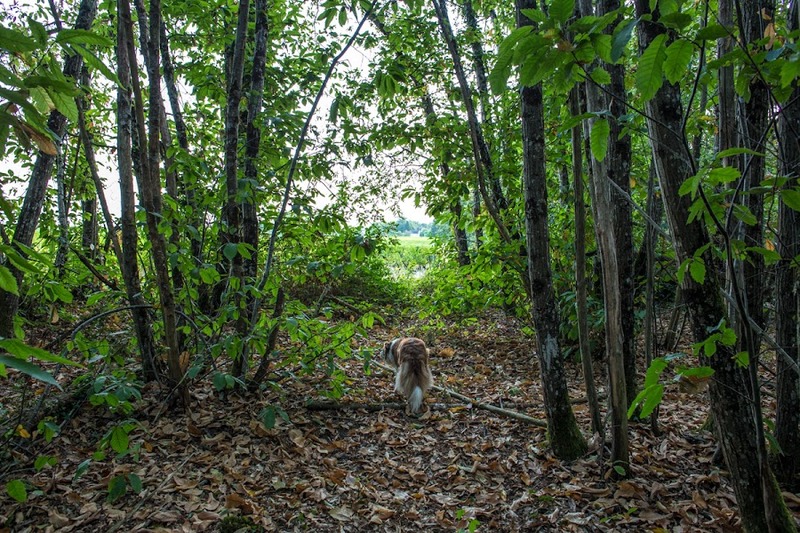 It leads us to one of her favorite paths through the woods. We're also starting to transition into cooler weather foods. I'm still doing some cooking on the grill and will do more when we have nice days. And I'm hoping we'll have many more nice days through the fall season. 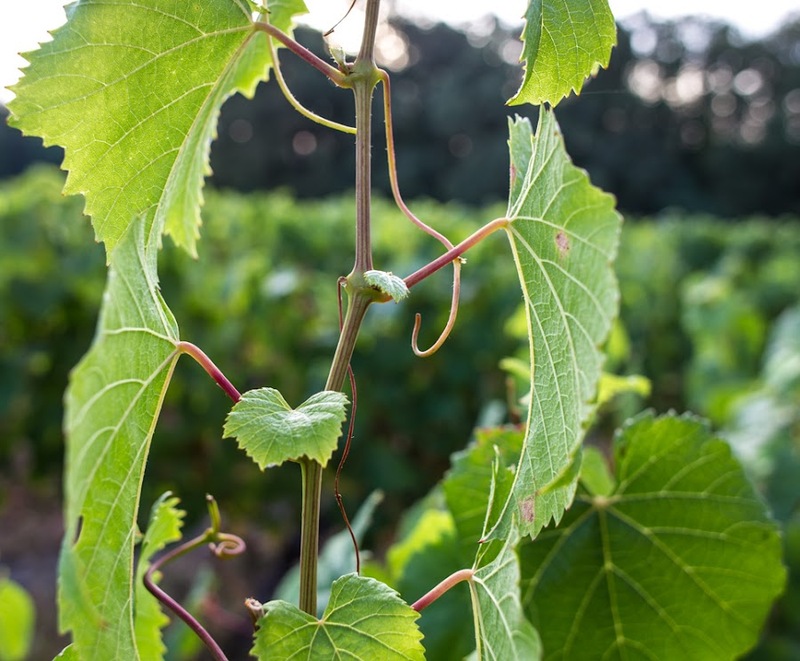 We're still a few days from the equinox and the astronomical start of fall, but some of the grape leaves in the vineyard are starting to change. There are always a few early ones. I'll wager that these are sauvignon grapes. Can you see them behind the leaves? We had another good rain on Friday afternoon and into the evening. I walked with Callie in a light rain just before sunset. 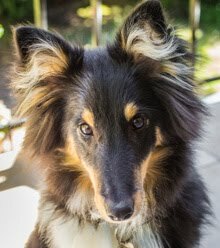 She doesn't mind it at all, being a border collie. The ground is so dry that all the rain in soaking in. There are no puddles or little streams draining water away. The ground is a dry sponge right now. The hot summer we had was very good to our tomatoes. Even with the late start they got, and with the lousy muddy clay they went into, they grew great and we had no signs of blight. Now we're reaping the rewards. A couple trays of garden tomatoes on the deck, waiting to be used and preserved. It's time to start harvesting the bell peppers now. And there are still a lot of eggplants out there, although they're smaller than the first round we got. The pumpkins and other winter squash won't be ready for a while. And we've left the greens in. They should continue to grow and produce as the weather gets cooler and wetter. The web was stretched invisibly across a path I was walking. I was just about to step through it when I noticed something hanging in mid-air at knee level. It was this spider and whatever prey it was dealing with. The wide-angle lens was not really right for this shot, but I took it anyway. I think it's a common garden spider. I'm wrong. 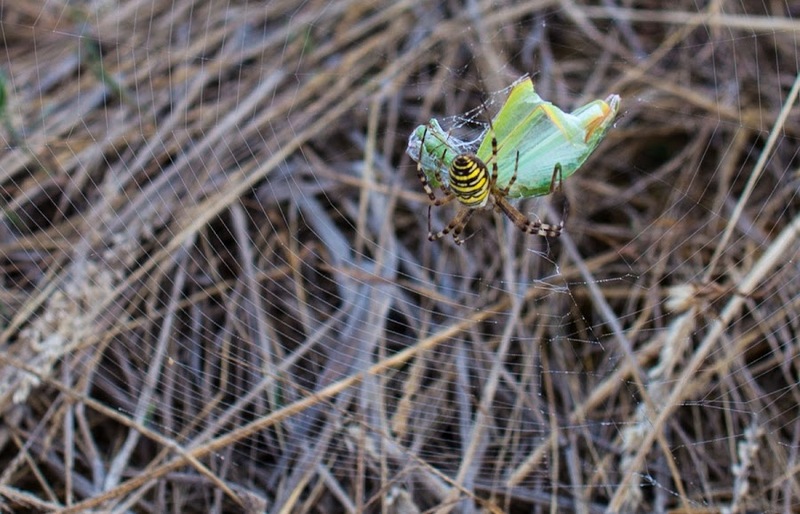 I understand it's a wasp spider. Thanks, Tim! We finally had some rain, although I don't think we got as much as was predicted. I haven't checked the rain gauge yet*; it's still dark outside as I'm typing this. It rained for a few hours during the evening and into the night. I woke up at one point and noticed it had stopped. There was no wind, unlike the previous night, so the rain just fell gently. * I've since checked. We got 20mm (just under an inch). Callie in the grass. Normally when I stop to take pictures during our walks, Callie stops and waits for me. But she will occupy herself with sniffing the plants, munching on some grass, or other things while she waits. This time she watched me long enough that I could frame and snap this image. With the coming rain, and overall fall and winter seasons, we will be leaving the dry paws days behind us and entering the muddy paws days. Joy. It's been uncharacteristically dry this summer. 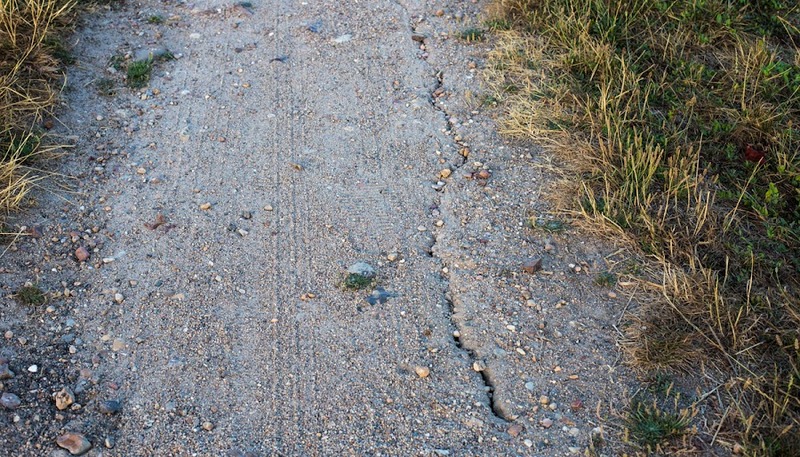 You can see it in the dirt road out back where long cracks, several centimeters deep in places, have appeared like little rifts along an active fault line. I lived in California for a time and saw larger versions of this. Thankfully, shifting tectonic plates are not the cause here. Just dry dirt. I prefer the road this way than to the muddy mess it often is. That said, we are expecting rain tomorrow. After an unseasonably hot day today, a weather system is predicted to push in off the Atlantic and bring us rain and dramatically lower temperatures. I dare say it will feel like fall. 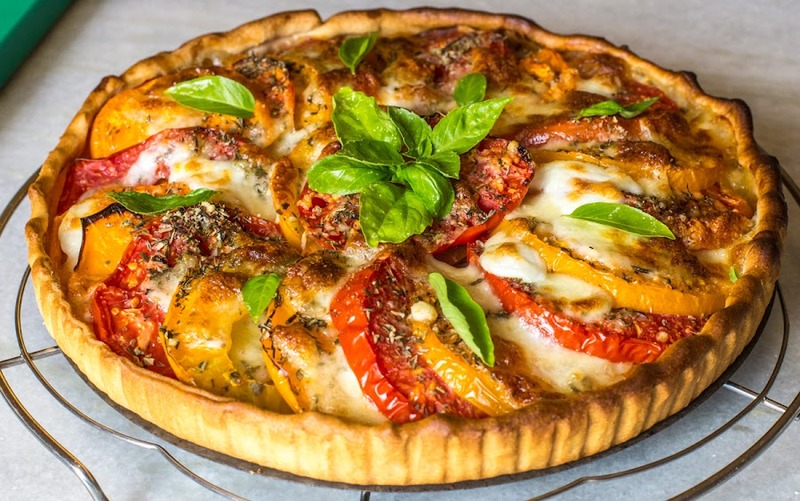 Among the things we can do with a glut of fresh tomatoes is to bake them into a tart. This is a relatively simple pie to make, especially with a ready-made crust. I don't often use them, but once in a while they make things a little easier. 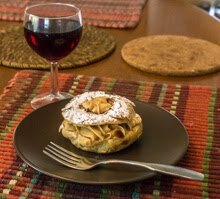 The tart shell is blind-baked, then it gets brushed with a layer of Dijon mustard. 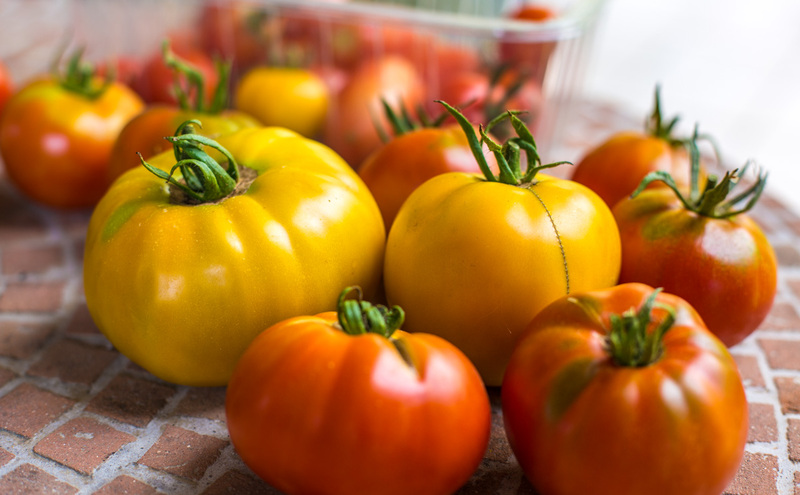 On top of that, a sprinkling of breadcrumbs to help soak up any juices, then sliced tomatoes are arranged in a circular pattern. It's almost like a version of pizza. I seasoned the tomatoes with salt and pepper, thyme, and oregano. I added chunks of mozzarella cheese and some grated parmesan. After a little drizzle of olive oil, the tart went into a hot oven for about thirty minutes. I let the pie cool before serving it, garnished with some fresh basil, as a combined salad/cheese course with Sunday's lunch. Yum! I don't know what dogs see when they see a hot air balloon. Whatever it is, it drives them crazy and they bark and chase the thing as far as they can. Maybe it's something similar to howling at the moon. Callie reacts to the moon the same way she reacts to a hot air balloon. The balloon rises with the sun. 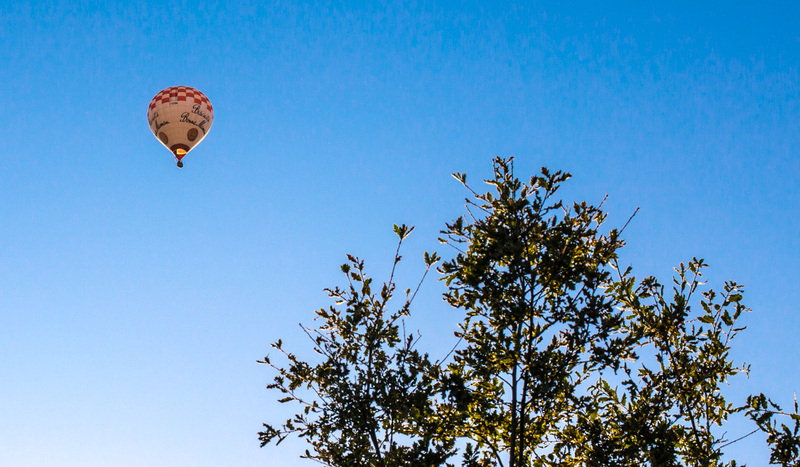 When we went out for our walk on Friday morning, I heard the familiar "whoosh" of a balloon's propane burner. Sure enough, a balloon was climbing up in the southern sky. It was moving very slowly toward us; there was very little wind that morning. 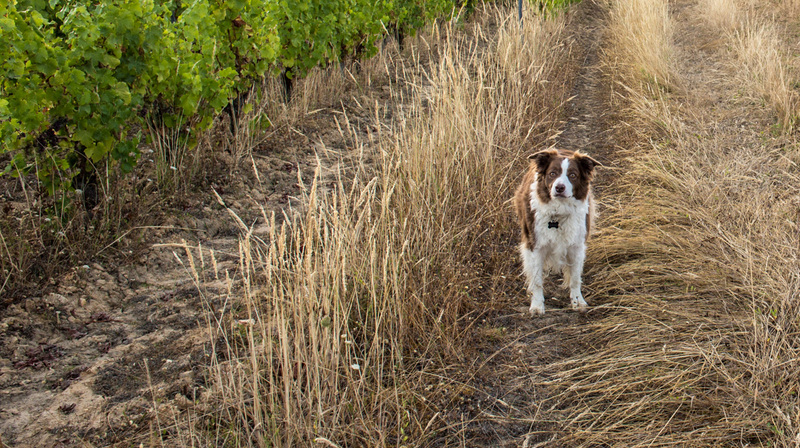 Callie started barking and running around the vineyard, up and down the rows, trying the chase the balloon away. I could hear other dogs in the distance, under the balloon, doing likewise. The balloon is an advertisement for a well-known brand. 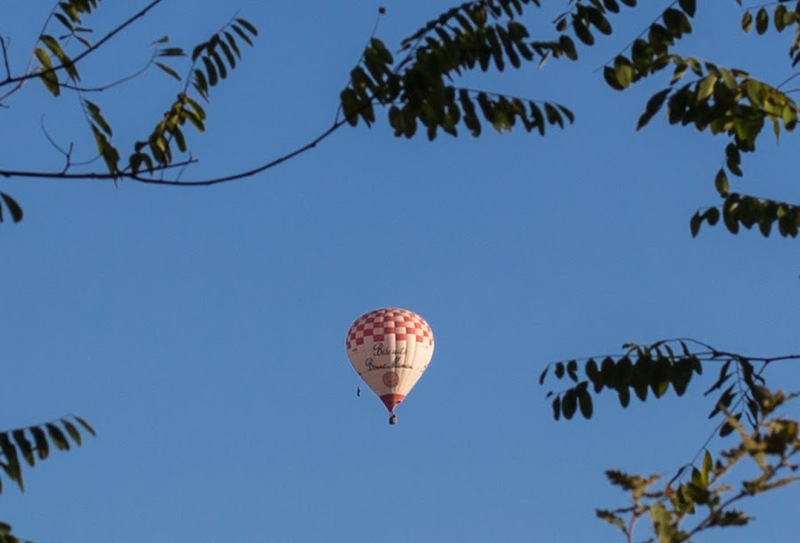 Eventually the balloon crossed our path and moved very slowly on toward the north before disappearing from view behind some trees. It was only then that Callie calmed down. She had once again saved us from a horrible end by chasing away that big, menacing ball in the sky. You didn't think I'd let Bertie's present go unphotographed, did you? If you've never seen one, this is a mole. It's dead, obviously, but there's no blood or guts. Thankfully. Bert just dropped it on the deck, presumably for us to eat (we didn't). It's kind of cute, even if it is dead. And, in case you didn't know, the color of a mole is taupe. That's also what a mole is called in French, une taupe. I've only seen two alive. One of them was a mole that Bert had caught and brought to us many years ago. I killed it rather than let it go back to dig up my yard. The other I actually saw scurrying on the ground; it disappeared into its hole just as I realized what it was. When we first got moles in the yard I was upset. They create little mountains of dirt all over and the ground is spongy where they burrow. And when they dig in the vegetable garden it angers me. But I've long since given up trying to battle them. They're supposedly good for aerating the soil, and they eat the larvae of nasty flying insects. I've also learned to use the dirt from their hills to fill in ruts and other low spots in the ground. Still, I don't lament the occasional kill. This is another one of those places that Callie likes to walk. Here, we're next to the piney woods, a place that we've walked a few times. The brush is thick on the edges, but we can usually find a deer path in. Once inside, the walking is nice because there is no undergrowth, and the ground is covered with a thick layer of pine needles. Callie has an easier time than I do because she doesn't have to duck and weave around the low branches. 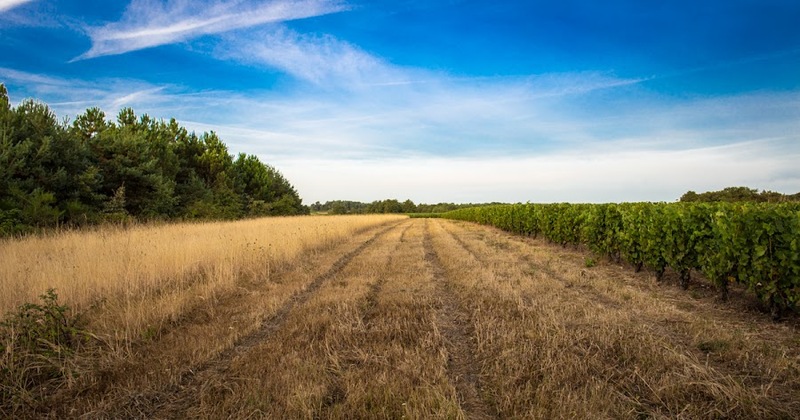 Someone mows a wide swath of the tall grass between the piney woods (left) and this vineyard parcel (right). Bert surprised us yesterday afternoon with a mole. He rarely catches moles (this may be his third in eight or nine years) and he doesn't even attempt to eat them. I read that cats don't like to eat moles. They must taste bad or something. I hope he got this one from our back yard. They're not very active right now, however. I think that the dry summer has driven them down toward the stream beds where the ground is more damp and there's more food to be had. Most of the grape vines in vineyards out back are regularly cut back during the summer. 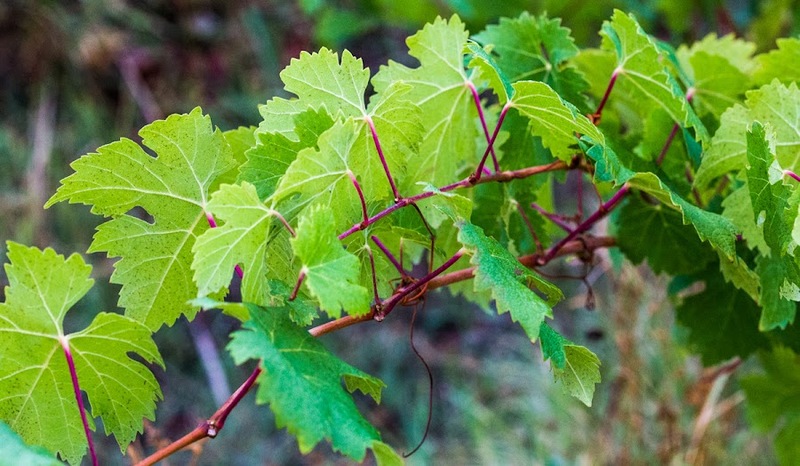 I think this is done to channel the vines' energy into producing grapes, not leaves. 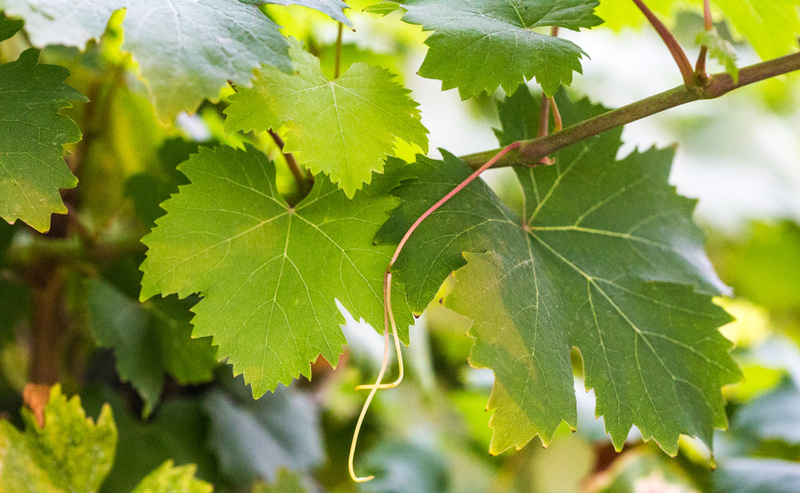 The process is mechanical and leaves the vineyard with a neat, closely-cropped look. Here and there, however, a vine will send up tendrils that grow up and out of the pack. This stalk rises a couple of feet above its parent vine. We're still enjoying very nice weather and the forecast is for more. Rain will come eventually, I'm sure, but it's not coming this week. 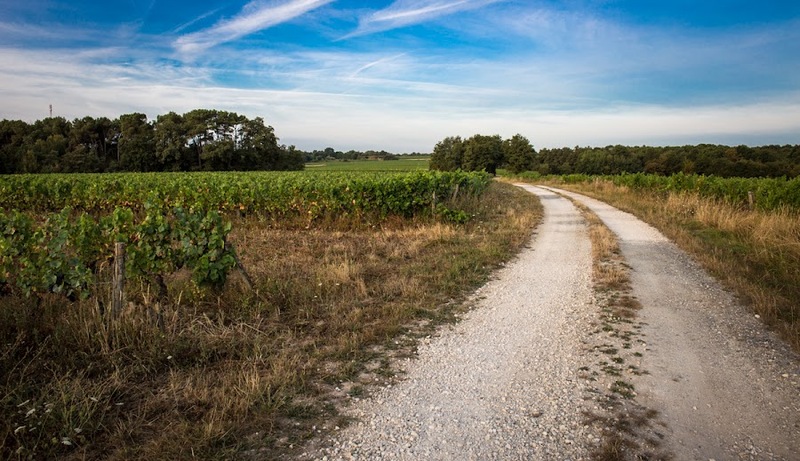 Yet another view of the dirt road that leads out through the vineyards behind our house. The vines end more or less at the horizon. Beyond them are colza and wheat fields and forests. The dry dirt road through the vineyards behind our house. Mid week is hot again, although not as hot as it was. We're enjoying this nice time because we know that fall is coming. With it, rain and cooler days. The kind of cooler days that mean no more shorts and tee-shirts, keeping the doors and windows closed, and the coming of fires in the wood stove. I look forward to autumn, but I will miss summer. 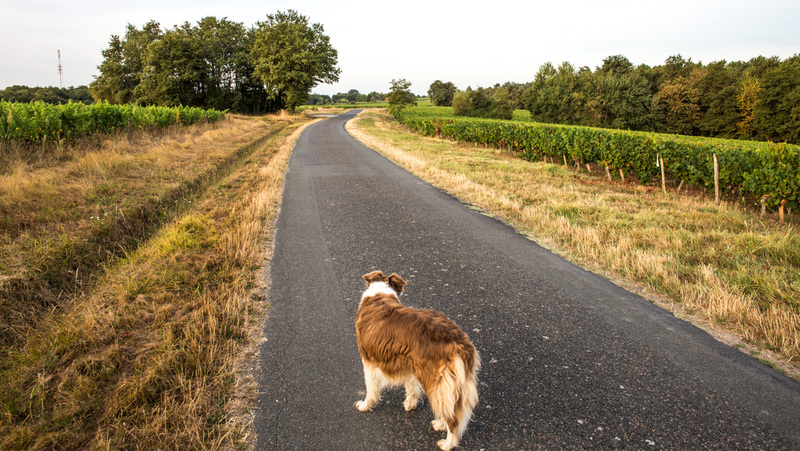 Among Callie's favorite things is walking around the edges of the vineyard parcels out back. 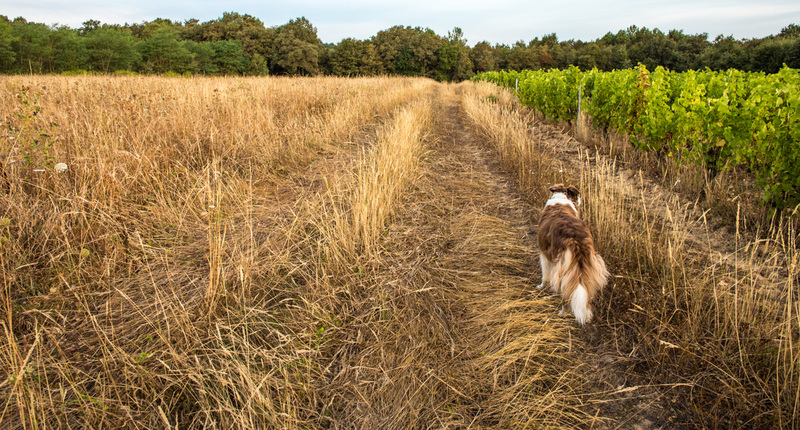 She prefers the space between the vines and the woods to walking on the dirt road. In some places the passage is just wide enough for us to walk through, in others it's a path as wide as a tractor. And in still other places, like this one, there's a field of tall grasses between the vines and the woods. We walk in the path made by tractors between the vines and the tall grass. Callie is ever watchful for rabbits scurrying about or deer browsing among the vines. The critters usually see her first and are long gone by the time she notices them. But she does often hear them escaping and will give a brief chase, albeit in vain. Callie and I went through the woods on one of our recent walks. She knows the way. In fact, I think the path that exists there is one that she's made with us over the years. In this picture we're coming out on the eastern side toward home, but normally we enter here and go the other way. Thankfully, there are no lions or tigers or bears. Oh my. The temperature has dropped and I feel much more comfortable. It's not cold at all, but it's not hot, either. Phew! Things are supposed to stay relatively warm for the next few days, with a hot day thrown in around mid-week. Can't complain. Callie likes to look where she's going. Especially when she's on a paved road where there might be cars or tractors. There were neither on Saturday morning when we were out there. Looking west. We turn into the vineyard where those trees are on the left. I took my wide-angle lens for a walk with us. I'm still working on learning the new camera. It's not that difficult, but I'm using fixed lenses for the most part. Now I'm thinking of getting a new zoom lens, wide to medium focal length. The one I have for the old camera doesn't work on the new one, and I kind of miss having that flexibility. Time to do some internet research. I'll tell you: stacking wood is a heck of a lot easier than having to saw and stack it. We found some people who cut wood to the size that fits in our wood stove. And, they deliver. So, after they dump the wood in the driveway, we stack it against the house. I'm happy not to have to saw it myself anymore. The stack is two rows deep, with a third row started. The board leaning on the right is Bertie's ramp up to the deck above. Stacking means hauling each log a few feet, but it also means picking out the half-round logs for the "towers" at each end of the stack. The towers hold the rest of the wood in, so we can have a nice, neat woodpile. These days, I stack the wood under the part of our deck that wraps around the north side of the house. Rain rarely comes from the north, so it stays pretty dry through the winter. We have tarps to cover it all, just in case. This is what is left to stack as of Friday. I may get it done today, but will definitely finish by Sunday. This year we seem to have an abundance of half-rounds, thankfully. I've stacked for two days now, and have one or two more days to go, depending on my stamina. You must realize, though, that I only stack for about an hour, hour-and-a-half, each day. That's enough work for me. The grapes are ripening more and more. I will be interested to see when the harvesting starts, although I'm sure it's weeks away, at least. The paucity of rain this summer has meant fewer rounds of spraying out there. 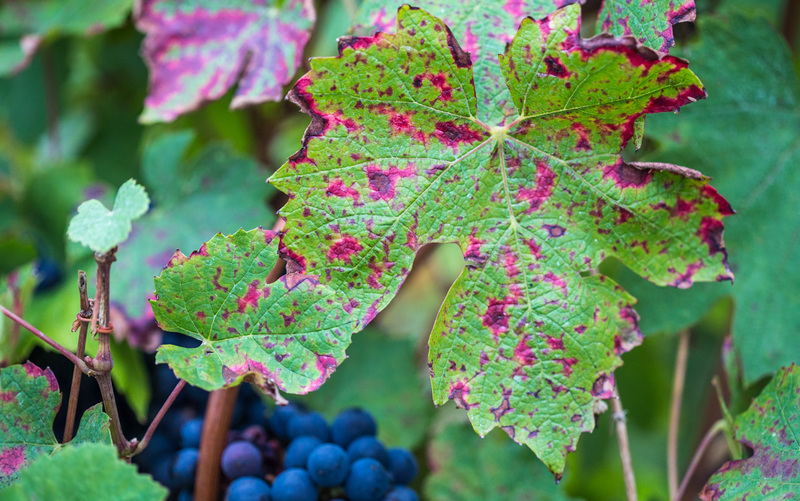 The fungus that can attack the grape vines needs humidity to flourish, and it has not been very wet. 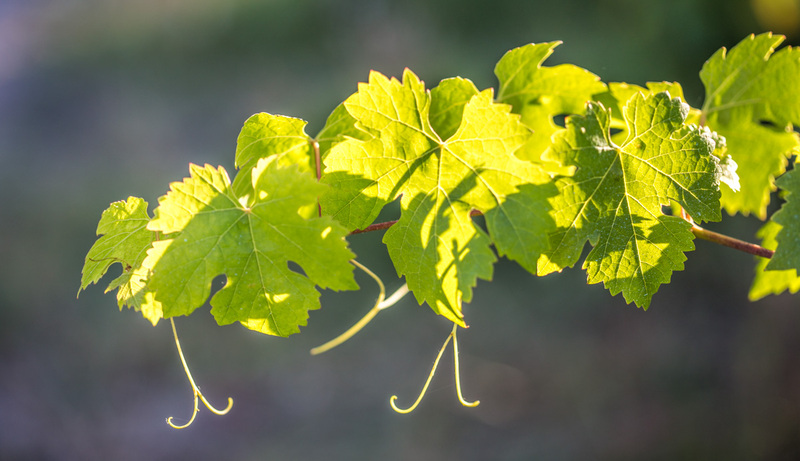 Grape leaves and tendrils on a sunny morning. These could be sauvignon or cabernet franc leaves; I'm never certain. 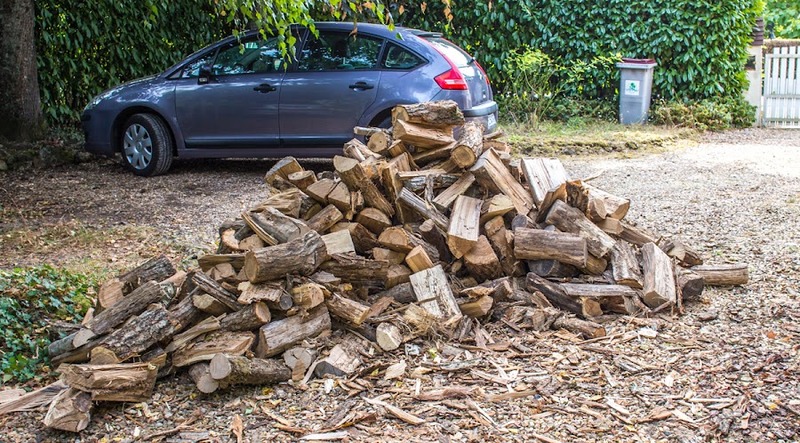 Our firewood was delivered on time Thursday morning and I've started the process of moving and stacking it. It doesn't have to be moved very far, thankfully, but I'll be out there working on it for a few days. Maybe I'll take some photos! They're starting! Already we have two or three bowls of tomatoes in the kitchen. And we're starting to eat them as they ripen. So good! Salads, ratatouille, etc. But it won't be long before we'll need to do some preserving. Sauce is easy and good, but oven-dried works well, too. Wednesday's harvest of yellow and red tomatoes. The little oblong Juliet tomatoes are very happy this year. They're very good for salads, but would also be excellent candidates for drying. 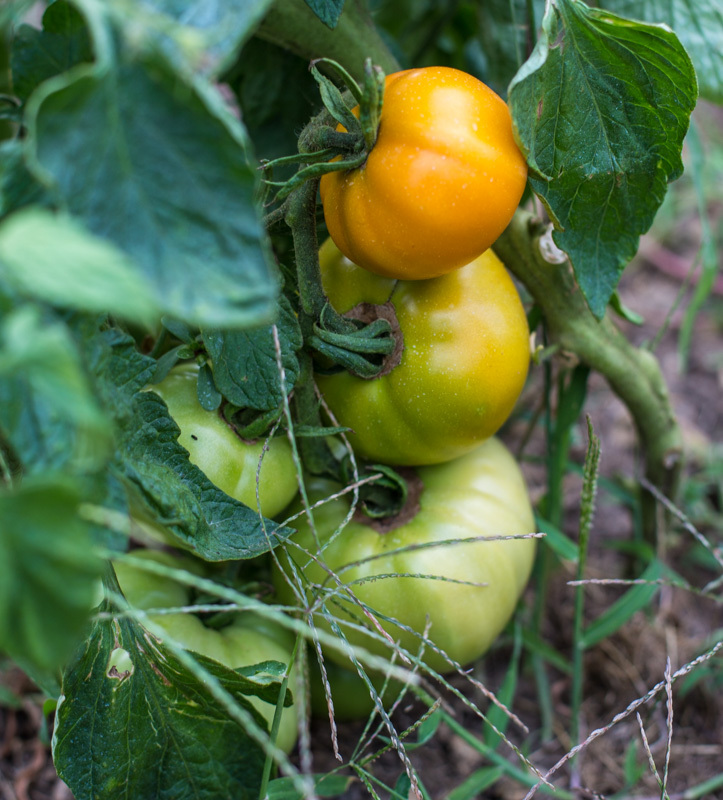 The yellow tomatoes are doing well this year, too, and are good for salads and sandwiches. Oh, now I'm hungry! 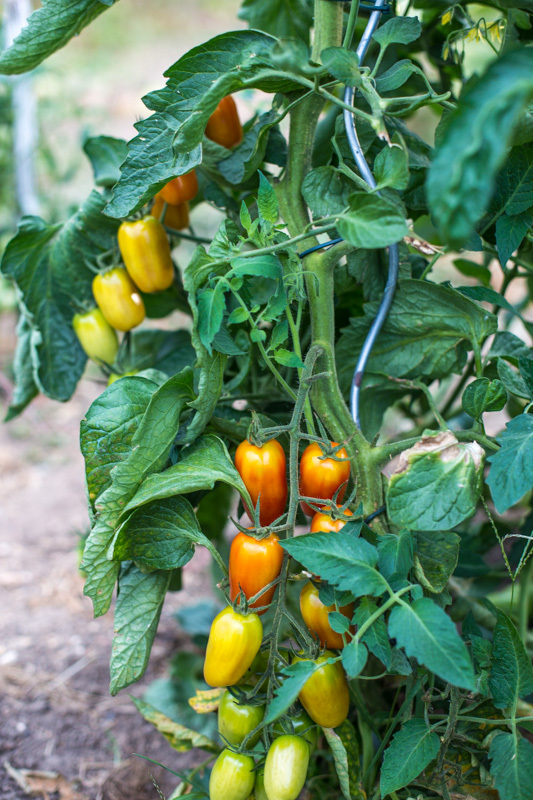 Yellow toms in various stages of ripeness. We're getting a delivery of firewood today for the upcoming winter. Four stères (four cubic meters) will be dumped in our driveway sometime this morning. It will take a few days to get it stacked. The good part is that it's already cut to the right length. I am no longer in the lumberjacking business. Oblong Juliet tomatoes ripening on the vine.